Clover Needs: A supportive owner to help her settle in. 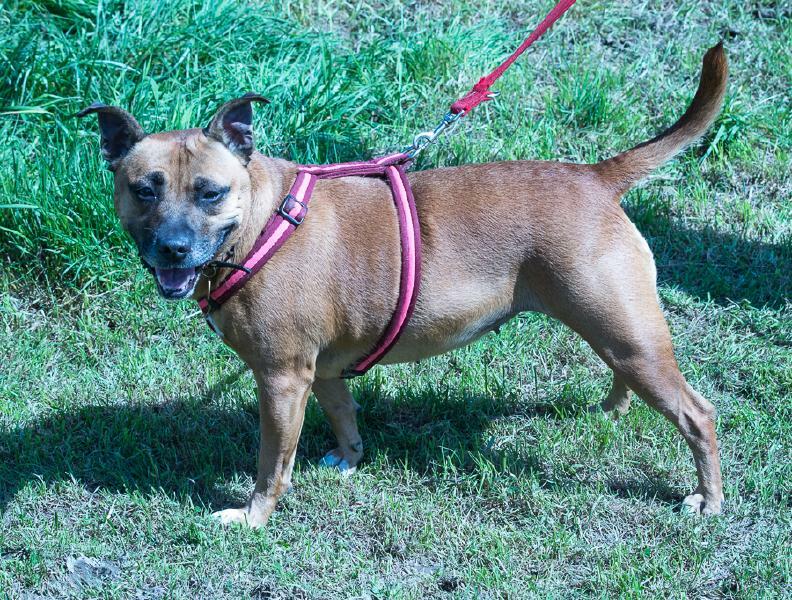 Clover is a terrific dog and will show you how special she is in the home, she becomes very connected with the people she bonds with. 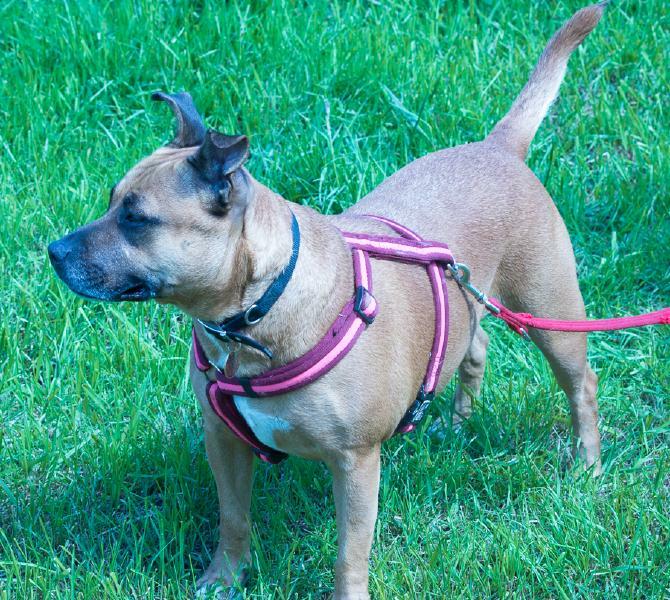 Clover would be fine around children as long as she isn't over hyped as with any terrier. 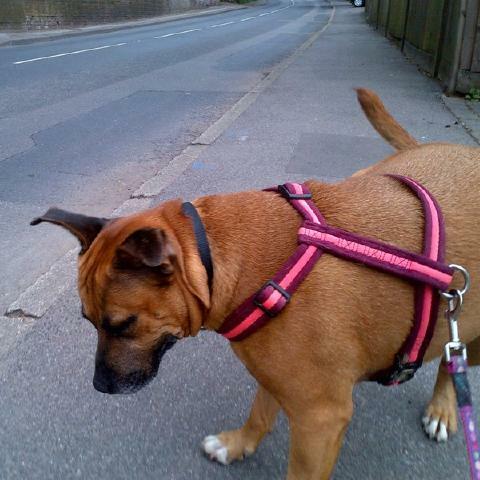 She has happily bumped along walking beside fellow dogs in the kennels. 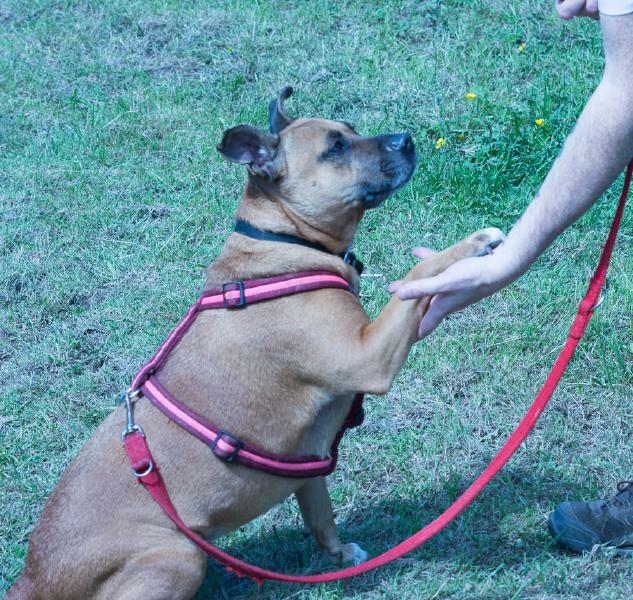 NB Our Rescue asks owners to maintain dogs on lead in public spaces and manage encounters, as dog law changes place dogs' lives at greater risk. 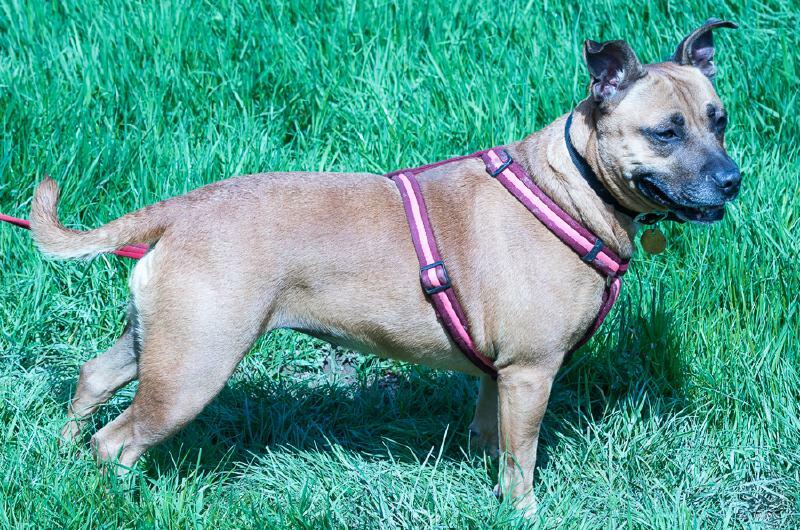 Known background: Clover was found straying, with an unregistered chip by a Rescue inserted during a neutering scheme. Their records could not trace the owner who was over 50 miles from the area found. We were asked if we could help Clover. We were delighted and Clover has captivated us ever since. 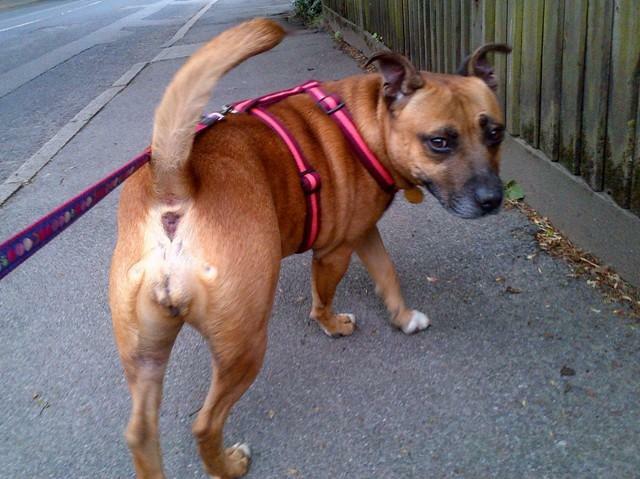 Clover is neutered, chipped and fully vaccinated. About Clover: Clover loves to receive attention, she loves water, to roll over, she loves life. 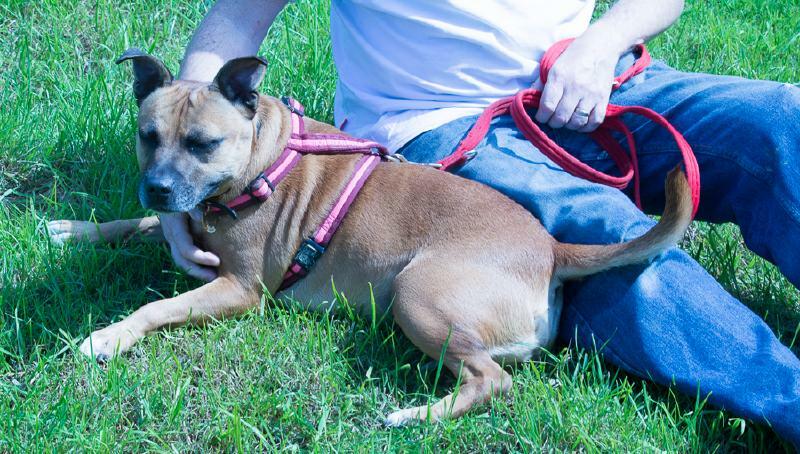 Clover is a very relaxed, laidback and mature girl and will adore her adoptive family. 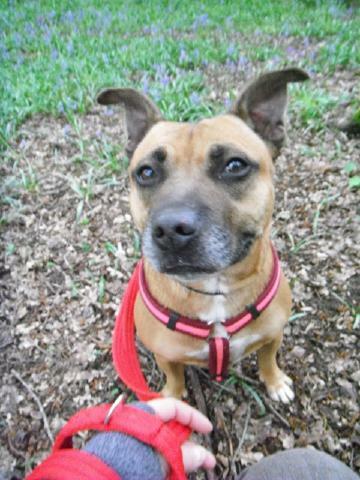 Clover is very good and laidback in the home and would do best with a home where someone is around most of the day. In her current foster home her confidence with being left alone has greatly increased, and she has been comfortably left alone for around 2 hours at a time. Clover travels perfectly in a car. Meeting dogs outside we tend to keep her moving and so she can get used to her walkers command and not be over enthusiastic in saying hellos. 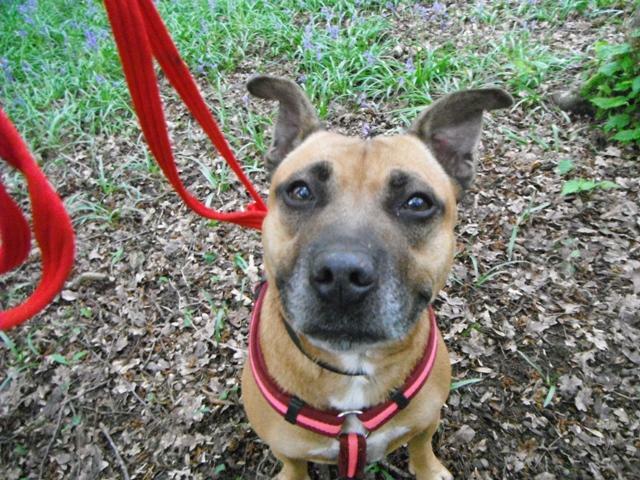 She has happily bumped along walking beside fellow dog friends in the kennels. If properly introduced to new dogs, and once she is familiar and walks become daily routine, she will settle even more. Clover is a people dog. Visit Clover's thread for daily updates, lots of pictures and videos. Please click to submit Online Application We will match you with a dog that suits your lifestyle, please remain open we successfully home 350 dogs per annum. We work fast to secure our dogs their loving homes. ***PLEASE HELP: We have to ask for £175 donation at the time of adoption, as we can't support so many dogs without funds. We have no state sponsorship and exist on the goodwill of the public and our supporters. Rescue Remedies offers our dogs back up for life. See Clover's Thread Below. Watch her progress through our Rescue. 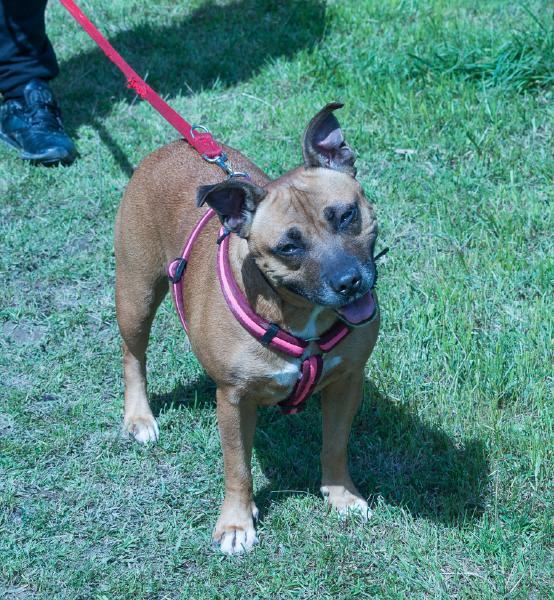 Original Referral Details: Jaqueline called to say one of the Staffies her Rescue had neutered & chipped in a 'free nip & chip scheme' had been found stray in Brighton. 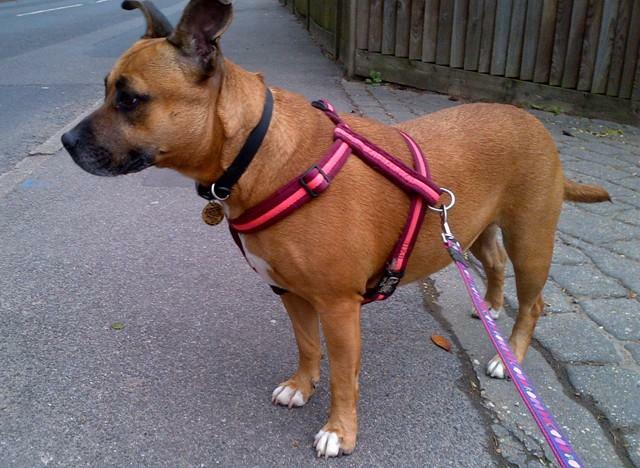 The dog warden said this Staffie had been seen stray several times but they hadn't picked her until now. Unregistered chip and no one has come forwards in the last 2 weeks. We were asked could we help her and make her safe. Jaqualine is arranging transport to bring her to us. 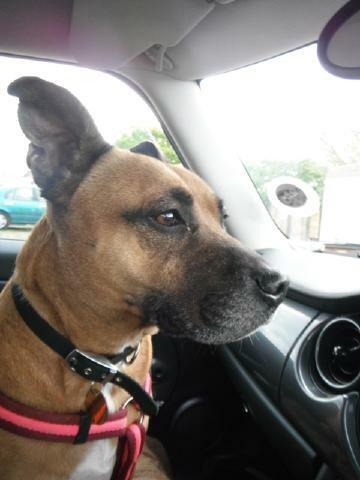 Clover was checked over by our vet Mark and he was very taken by her temperament, what a lovely dog!. He concluded she was already spayed, in good health, a little over weight. Mark said despite she has a greying muzzle felt that was premature and placed her in her 3rd year. Clover received her primary vaccination followed by a treat. 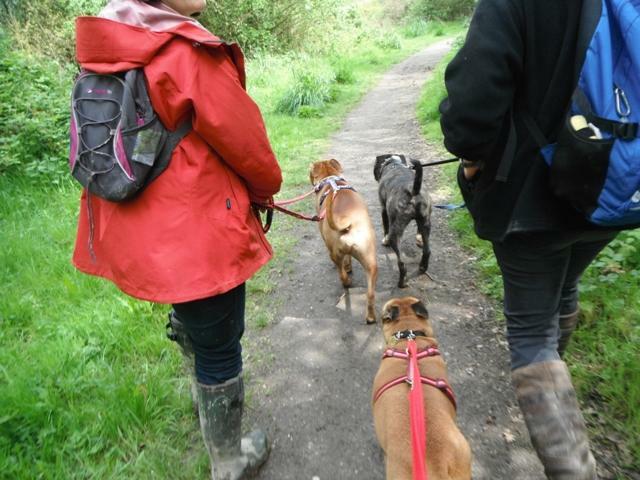 Clover was welcomed into kennels with open paws and was soon enjoying a walk with the 'big boys' Georgi and Atlas. Clover was very happy once she had made sure the boys knew their place...boys are to be seen and not heard and girls are to be adored. Georgi and Atlas are very easy going boys so despite thinking Clover was really quite lovely they were happy to let her fit in wherever she was happiest. Being new to this 'portrait' lark, Clover was happy to oblige although our first attempt at 'say cheese' resulted in quite a cheeky face. But Clover soon got the hang of it and showed me her 'best angle'. Then she finished off her first day with us, proving she really was going to take everything in her stride and was a very good girl in my car. She's a lovely girl, I have a feeling her home can't be far away. 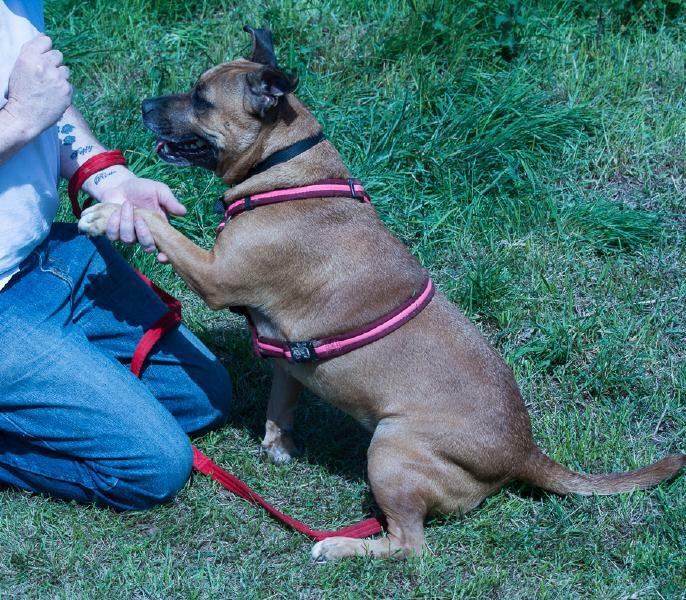 Someone has obviously spent time training this lady - she sits on command and as you'll see from the photos below she even gives paw (left and right). Dear little Clover was my first ever walk at Gatwick yesterday. I love Staffies and for me, this girl is right up there. A super, super girl. Clover was a good girl to harness and get ready. We walked with 3 other dogs and Clover was happy to lead the walk. She kept looking round and making sure that everybody was keeping up. A real character and such a sweetheart. Clover loves life! 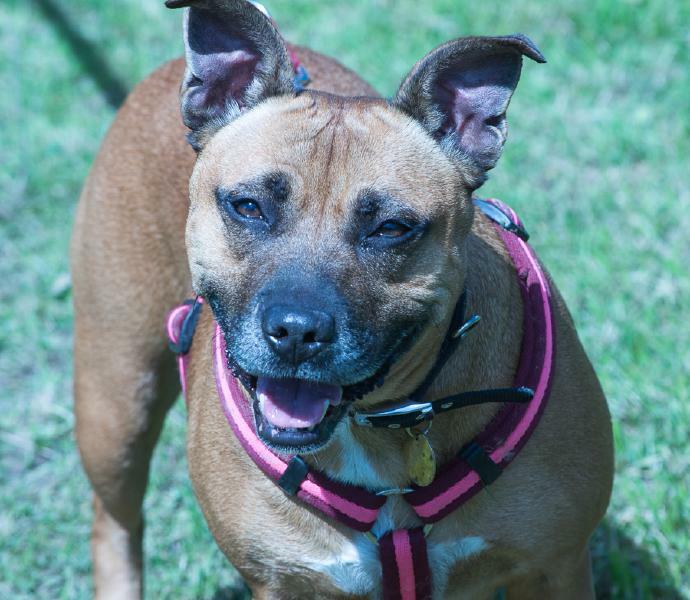 Busy, animated and affectionate, proper staffie girl. Cutie pie Clover helped show new walker Maddie how to harness up - although Clover made it SO easy I think we could have waited outside and let Clover do it herself! What a beautiful girl, full of sparkle and the joys of spring (although yesterday felt like winter)! 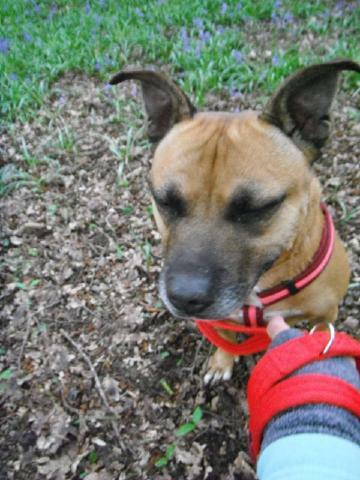 A joy to walk and cuddle with; just an all round super little Staffie girl. 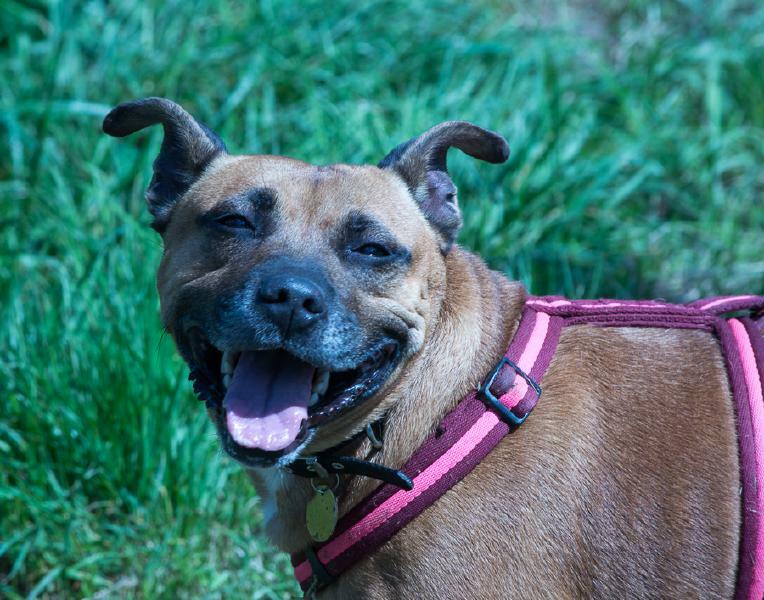 We're so lucky to have her at Guildford but would love to see her gone to her forever home. Clover is usually quite strong on the lead but today she walked on a loose lead and perfectly to heel when I asked, good girl!